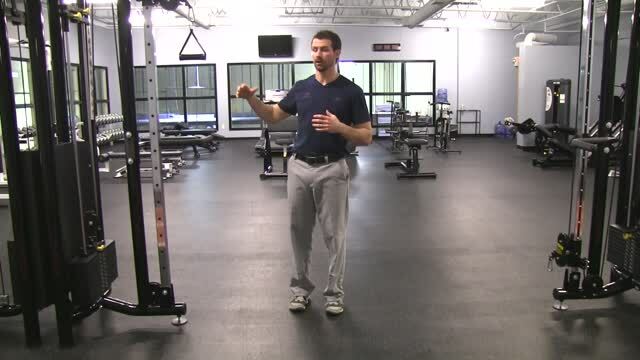 Description: The 1/2 Kneel Chop is a dynamic movement exercise that is great for creating power, stabilization and mobility during a rotational movement such as your pivot and coil in the golf swing. This exercise helps create strength in the abs especially with rotation, but also in a bracing fashion so that you are able to generate powerful movements even while rotating and in an unstable stance. It has the added benefit of providing shoulder stability which is important for both your backswing and forward swing. Start off by kneeling on one knee. Try to put your front foot in line with your rear knee. If you don't have enough stability this way you can spread it out a bit. Grab a cable with both hands. Note that the cable should be to the side of your body opposite the side to which your knee is on the floor. Set the weight to a weight that you can handle and work through the exercise with a controlled motion. Be sure to keep your upper body facing forward throughout the exercise. Grab the cable with straight arms and pull it down across or "chop" down to your opposite hip. Your arms will bend in the middle of the exercise and then re-straighten as you get to your hip. Begin with 3 sets of 8-10 repetitions with a weight that you can handle. As weeks progress and you get stronger be sure to add weight. Pull down to the count of one, hold and return to the count of 3.